I recall we discussed this hand long back on old forum... can we have inputs again??? Where did you get this prints, great job. His life line joins the fate line. But still the print is not clear. His jupiter top phalange looks quite long, also other top phalanges are quite long. 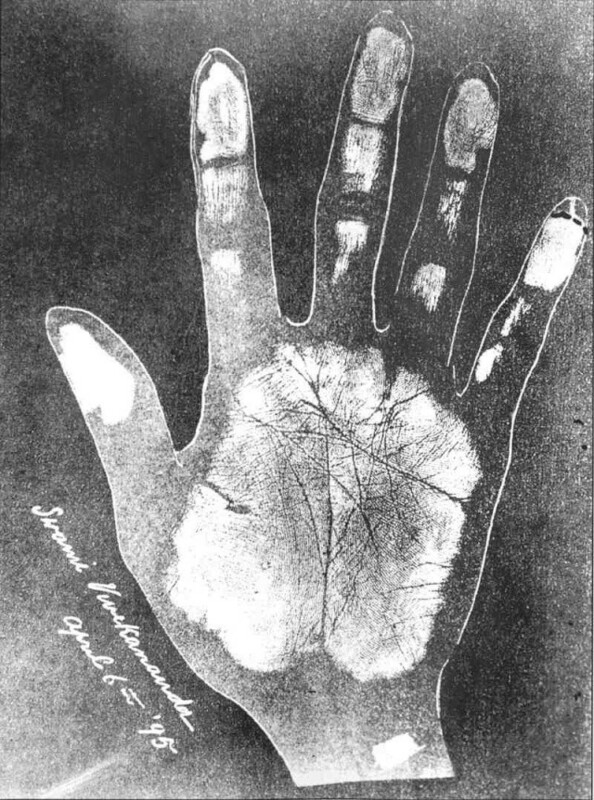 Refer your question for the reference to the hand prints of Swami Vivekananda. So far I have seen this image appear in two published works. 1.All Rand McNally Editions of Cheiro's "The Language of the Hand".All editions I guess.The 15th (1900) and 16th Editions have them for sure as I have the copies.Seems this is the only published ediiton of Swami Vivekananda's hand prints while Cheiro was still alive.I do not know if other editions existed prior to 1936.After 1936 the hand print ceased to appear in subsequent editions of Cheiro's "The Language of the Hand" published by Herpert Jenkins,London. 2.The second reference is in the Book " Photographs of Swami Vivekananda " Compiled by Vedanta Society of North California.Published by Sri Ramakrishna Math,Chennai,India. Elsewhere the internet is abound with the images of the palm print. This image at first seemed too ordinary until Mr Stalin in this forum had pointed a curious sign in the hand.Like if you watch closely between the lines of Head and Heart under the mount of sun you can find the symbol of a "Lingam" This was amazing to me when I first saw the post of Mr Stalin. Next is the symbol of the bow formed by the line of life,head and fate. Thirdly you can also find a symbol of Tree/Temple/Triangle like formation on the mount of sun. I could decipher the greatness of the Swami from the palms by looking at the following symbols only.Else it seemed to me an ordinary pair of hands with slight inclination to divination as can be seen from the seemingly almond and conic shaped fingers specially the finger of Jupiter. Thanks for the input. The lingams forms from the mount of sun (he should be blessed by the lord shiva) there are two triangles one on heart line and other on center of mount sun. Triangle on sun line can form Sanyas yoga according to Indian palmistry books... also they have mentioned Yogi should have thin clear lines which can be seen here..
1:-Having trident at heart line at jupiter mount and lotus sign at jupiter. 2:-Trdent at luck line at saturn mout. 7:-sign of fish at end of life line.